Nouveau Taylorism? Or a necessary step? Will blockchain futureproof against worker commoditization? Sometimes modern technology comes at a price. For all of Uber’s roaring successes in providing users worldwide with basement priced transportation and deliveries, the centralized company keeps around 35% of all transactions made – leading to comparisons between the company’s processes and slave labor. A centralized system prevents Uber from offering competitive prices to its customers and a fair share to its “self-employed” drivers. The reason for Uber’s unreasonable terms is mainly due to the costs, which include banking fees, marketing, payment processing, etc. 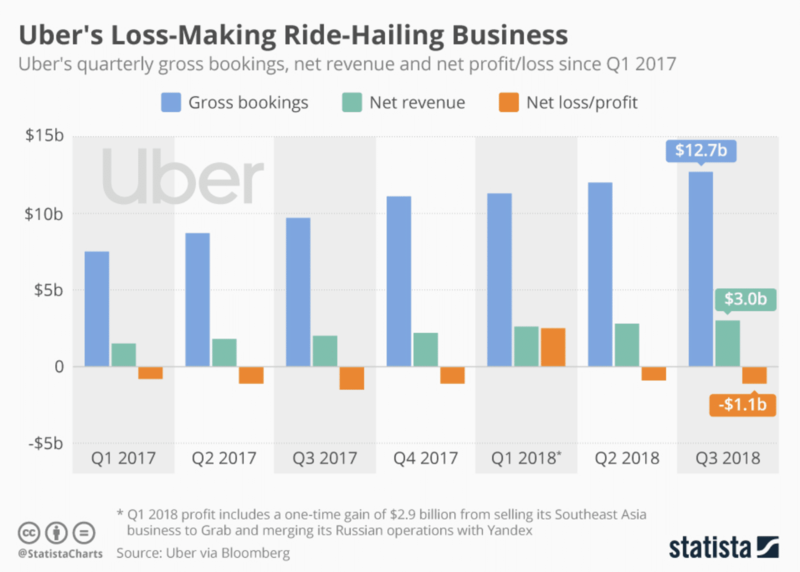 Although Uber’s gross bookings continue to grow, so does the quarterly loss. As technologies grow around us, so too do concerns that modern workers are slowly being commoditized by the big businesses that have the power to drive automatic changes to old-fashioned industries. In 2016, Julia Rampen found that Deliveroo drivers would need to work for 74 hours per week just to cover the average rent for a single room apartment in the UK. It’s clear that at this moment in time, we’re more reliant than ever on the ethics of businesses that leverage cutting-edge technologies. The consequences of embracing automation for the sake of profit margins, over the fair pay of staff who ensure such services run smoothly, could be catastrophic for workers worldwide. Luckily, many businesses are now recognizing the need to help workers as a priority, and have begun to utilize blockchain technology as a force for positive change. 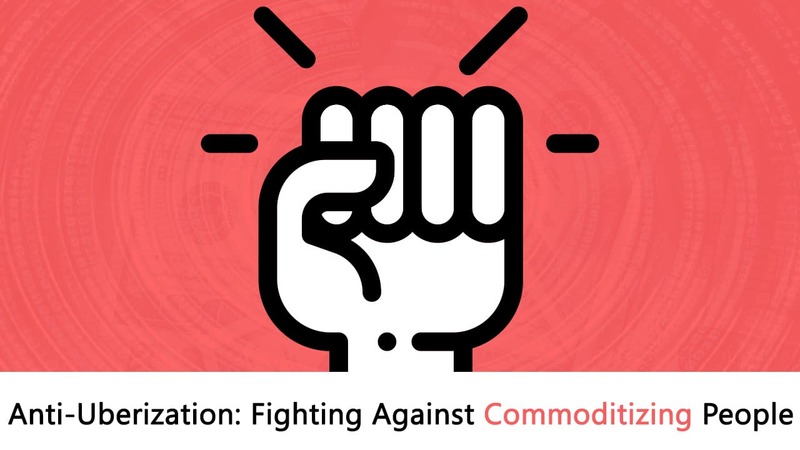 Here, I take a look at the ways in which employees and job seekers alike can benefit from the organizations and incentives looking to fight back against the commoditization of workers. ITProPortal has forecast that we will soon benefit from a jobs market that rewards users for their information, which currently offers a stark contrast to the current climate of insecure personal data and breaches. The logic here is that companies will reward jobseekers with tokens whenever a company views their online information. This enables users to make some financial gains during the jobseeking process – which will no doubt be a welcome change to the more analogue approaches to finding work that is still prevalent today. ITProPortal reasons that users can collect tokens upon setting up their profiles and receiving views from companies which could later be exchanged for further education courses and investments in their own personal development. Imagine a world where companies reward their users for information in such a way that it enables them to purchase a shirt and tie ahead of a job interview? Blockchain has the power to make such a rewarding process reality in the coming years. Blockchain and cryptocurrencies alike are also helping to provide stakeholders with genuine investment opportunities for fledgling businesses, too. While in yesteryear startups were dependent on heavy one-off investments that come at a cost of a sizeable stake in the company being surrendered to somebody who could have the power to drive the commoditization of workers, initial coin offerings (ICOs) have paved the way in bringing the power back to people and freeing new businesses of prospective corporate shackles. In fact, the entire cryptocurrency market capitalization stands at around ~$140 million. Crowdfunding is a relatively new and highly charitable prospect where individuals are free to donate to a cause they’re passionate about, but ICOs go the extra mile in offering a legitimate stake in a new company. The way the process works is that businesses in the early stage of its development release a cryptocurrency – often referred to as a ‘token’ – available for public purchase. This effectively gives individuals something of value that they could then reinvest in the startup’s internal services once it establishes itself, or exchange for another currency online. It’s for this reason that ICOs can play an important role in helping businesses to develop organically. Startups are essentially allowed to stick to their vision without any investor influence, while interested parties are presented with their own currency that can grow at the same rate as the business does – thus reversing the flawed notion that people are commodities, when, in fact, they can unite as a driving force in a company’s formation. Humans.net is one company that’s firmly focused on providing a fully decentralised peer-to-peer based platform to fulfil plenty of our day-to-day needs in the jobs market, or accessing entertainment, or taking out insurance, or just about anything you can imagine. The idea behind the platform is to behave in a totally self-sufficient manner, and to utilise blockchain where possible to bring added security to the service. Users will ultimately be able to rely on not only blockchain technology but also DNA-based verification methods to make sure their sensitive data remains safe at all times. Significantly, Humans.net aims to revolutionise the jobs market of today. Users will be able to create active profiles that categorise their skills, location and encapsulate their personality in intelligent bios for prospective employers to understand whether an individual will be an effective fit for the company on a personal level. On the flipside, there are plenty of voices worldwide that hail Uberization as a necessary and exciting step forward for technology, convenience and work prospects. The Balance argues that Uberization is simply the process of addressing a market that’s either local or hyperlocal, that’s fragmented with many small providers, and that’s characterized by unpredictable customer experience. When such a market is identified, a startup lists service providers, allows access to them, facilitates the booking service, and standardizes the experience and pricing. The Bangkok Post believes that Uberization facilitates a highly effective matchmaking platform between users and the gig economy. Where hailing a cab can be an arduous process in many large towns and cities, Uber’s app automates the process and puts users in touch with a driver who then immediately knows your location and destination. The technology available to the driver is so advanced that they aren’t required to have a large skilled knowledge of an area to taxi people around – enabling prices to be lower than that of more established and prestigious cab organisations. While the art industry is a largely subjective one, and artists can often struggle to find an audience willing to pay the money to sustain their work, Etsy has Uberized the process of buying artwork in a way that’s enabled just about anybody with enough talent to become a retailer. Users can search for and discover works that they love and place an order on a platform that might just kickstart the careers of artists that could otherwise be lost in the wilderness. Airbnb has been an exceptional performer in bringing Uberization to the hotel industry. Through this service, homeowners are capable of listing their properties for users to stay in for a predesignated amount of time. The profits for some high-end buildings are staggering too – with some hosts making up to $10,000 per month. TaskRabbit is another Uberized solution for users to find ready and able workers to run errands for fees. Much like Etsy and Airbnb, TaskRabbit uses a search-engine style format to matchmake users with their professionals. A key facet of Uberized technology is that it’s peer regulated through user reviews and ratings, which helps to create an ecosystem where consumers have more confidence in their purchasing decisions. According to the Grenoble Ecole de Management, a French business school, the methods used in Uberization bring enhanced connectivity for services that could otherwise be much more difficult for the public to utilize in a way that greatly benefits both users and the service providers. However, it comes at a great cost to the workers who make such services work. ‘Taylorism’ was born from the industry practices of Frederick W Taylor in the early 20th Century. His idea of production efficiency methodology consisted of breaking down all of his workers’ actions, tasks and jobs into straightforward segments that could be analysed and taught by the managers assigned to each group of people. Speaking to the Financial Times, Jeremias Prassl, a professor at Oxford University agrees that Uberization is an example of Taylorism rearing its head at the expense of workers. “Algorithms are providing a degree of control and oversight that even the most hardened Taylorists could never have dreamt of,” Prassl elaborated. We find ourselves at a point in history where delivering convenience is of the utmost importance. But is blockchain capable of providing a better level of convenience than an Uberized marketplace? UPS’ Director of Public affairs, Edouard Barreiro certainly thinks so. Barreiro highlights the fact that the disruptive potential of blockchain gives us a glimpse into a future where third parties and self-serving platforms have much less power and influence among consumers, which means lower fees and faster transactions. In fact, according to FOTON, by utilising a decentralized blockchain system, the entire industry can save up to ~$36 billion a year. “With Uberization, the value moved from assets to platforms. This value was based on users (network effect) and turnover, but once those platforms become less useful, the value skews back toward assets. People will not choose a platform but rather a capability or an asset owner”, says Edouard Barreiro. Because the assets that people desire are in the hands of their owners, as opposed to middleman platforms, this means that blockchain’s security and efficiency can be tapped into to create direct links between asset owners and consumers. The rapid rise in the influence of blockchain-based ‘smart contracts’ supports Barreiro’s sentiments. Because of how untamperable qualities of blockchain and the technology that its infused with, users can execute reliable agreements with service providers where transactions only occur once the parameters are met. Blockchains can’t be retroactively edited so there is no risk of fraudulent behaviour between both parties and thus little need for a middleman or platform. If the need for Uberization dwindles in the face of efficient blockchain technologies, it’ll represent a big win for both workers and consumers. With direct links being set up between the asset owners and those who require said assets, there will be no extra money needed to appease the likes of the Ubers of this world – enabling better pay for the workers who make their service the success it is today.